I won’t run in to details of what happens in the scene as its pretty much explicit. 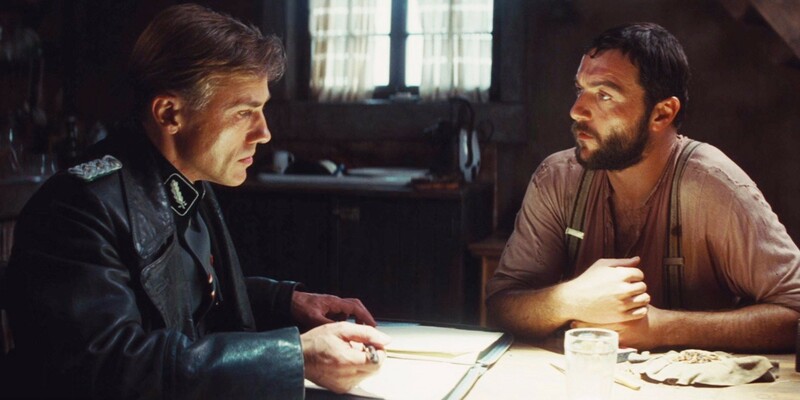 This is widely recognized to be Christoph Waltz aka Hans Landa’s best performance till date. It got him laurels, accolades and many awards including Academy. 1) We have to understand it is just not feasible for Hans to personally look out for the persecuted jews. The soldiers had already visited the place a year back and did not find anything. This time Hitler sends his best (“jew hunter”) to cross out all suspicions. The reason he is best at his work is predominantly because of his psychological demeanor. 2) He requests farmer to let her family members go out of the room as its private conversation. By doing this, he is making sure he can target his mind without distractions. 4) During the start of the conversation, farmer is confident and has upper hand. This is deliberate strategy of Hans who wants him to feel very comfortable initially so that if there is a change in mannerism, he can spot it via means of contrast. 5) The analogy of the rat and squirrel was the most effective trick used by Hans. He made the otherwise appalling act of merciless killings seem to be like a natural human tendency. 6) Hans is never seen in movie smoking a pipe. However, he deliberately takes out the big pipe to indicate his expertise. He specifically asks farmer if he is aware about what he is known for / as. 7) He asks for the milk refill but never drinks. His objective seems to prolong the conversation so he asks for a refill out of customary obligation. 8) The final stage is when he looks in to the farmer’s eyes and mentions categorically that his family will be safe and in-fact be rewarded if he tells the truth. It is important to notice the timing of this statement. If this was said during the start of the discussion, it won’t hold much water as it did in the end. Reason being that farmer is now convinced that this time he won’t be able to trick the soldiers and has to make a quick decision if he wants to keep himself and family safe or not. 9) Hans wants to make the killings as quick and effortless as possible. This is just a chore for him no different than uprooting plants in the fields. Therefore, he does not want them to run & chase. 10) Hans does not care much when Shosanna runs away because of the gun not being loaded with bullets. He seems to be playful about it just like you don’t chase an animal if it runs away while hunting. You simply choose another one to hunt. Quentin highlights that a scene can have intensity, tension, anxiousness without unnecessary dramatics and morbid background score.